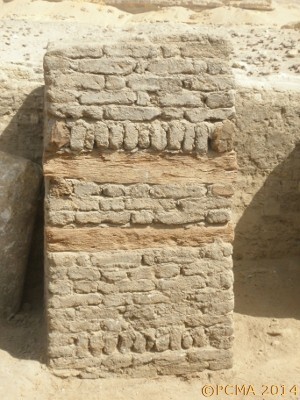 Archaeological fieldwork at the site of the monastery of Nekloni in Fayum, conducted by a team from the Polish Centre of Mediterranean Archaeology of the University of Warsaw, directed by Prof. Włodzimierz Godlewski, was primed to a revaluation of previous exploration in complex D at the northern end of the central kom and further excavations of the architecture discovered in this part of the site [Fig. 1]. The season was brief due to the still tenuous political and social situation in Egypt, but the results extremely productive. Another season is planned this year in the fall. The building complex in the northern part of the plateau comprised two tower keeps and a set of dwelling and domestic structures. It was built most probably in the 7th century and was occupied and successively developed through at least the end of the 12th century. It was an important part of the Nekloni monastery, encompassing living and reception rooms, work areas and open courtyards, as well as an upper-floor library and scriptorium. The present fieldwork was concentrated on the southern fringes of the explored area, uncovering three rooms in a row: D.50 at the eastern end, D.41 next to the west and finally D.44. The rooms along with the staircase between them, D.42, were constructed in the last phase of the rebuilding of complex D, most probably in the 11th–12th centuries, although the date of construction of rooms D.50 and D.41–44 has yet to be established with absolute certainty. The architecture extended already onto a rock slope falling away to the south, requiring that the ground be levelled under the new buildings. Rubbish appears to have been deposited in volume on the southern side of the complex, raising the level there to approximately 1.20 m above the floor level inside the rooms. 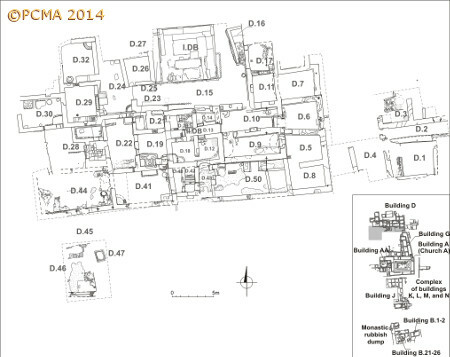 Room D.50, encompassing an area of 33.6 square meters (8.45 m E–W by 3.98 m N–S), was accessible from the west, most probably from the tower (DB.II) by the staircase (D.42). Two massive square pillars built against the north wall of this room presumably buttressed from outside room D.9 located immediately to the north of it. The walls of the room were not plastered, at least there is no evidence of wall render, and the floor was of mud mixed with straw. In the eastern part of the room there were two containers, D.50.1–2 (2.09 m by 1.04 m and 2.03 m by 2.65 m), which were used most probably for storing dry goods. 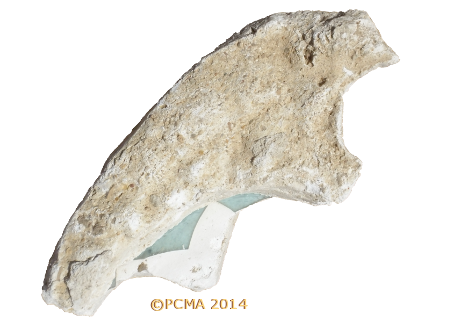 The fill included building debris of all kinds: bricks, limestone pavers and ceramic tiles, fragments of gypsum window grilles with remains of windowpanes [Fig. 4], wooden beams and narrow planks, as well as baskets in the lower layers. 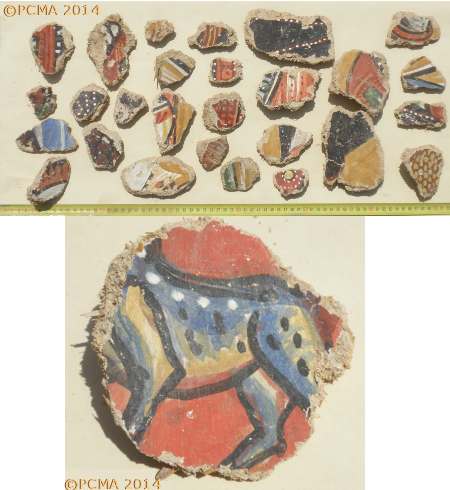 Hundreds of small fragments of plaster with vividly colored paintings were also recorded [Fig. 3]. 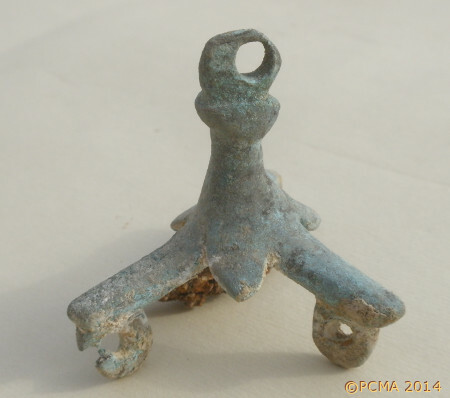 A metal suspension element from a hanging lamp or censer was discovered [Fig. 5].The pottery from the fill was limited practically to amphorae and bottles, some of them still with mud stoppers sealing the mouths. 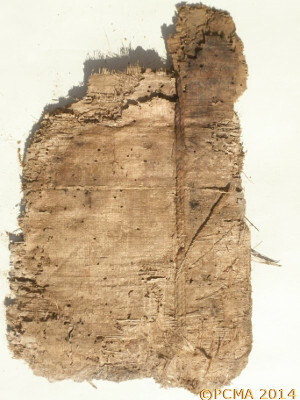 A few Coptic texts, identified as letters, and a few leather book covers in fragments [Fig. 6] were also recorded in this assemblage. Room D.41, which was partly excavated in 1998, was a large area (25.8 square meters, 6.62 m E–W by 3.90 m N–S) situated to the west of staircase. Its walls were plastered and the floor was of mud mixed with straw. A pit had been explored before in the central part of the room and now two small containers were discovered in the corners of the room. 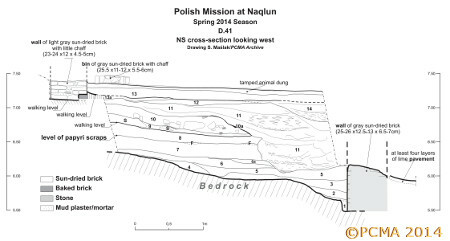 The stratigraphy of deposits in this part of the kom was explored in a small test trench traced in the western part of the interior [Fig. 7]. It was dug down to bedrock and was found to be filled mostly with sebakh soil. About 0.80 m down, the character of the deposit changed, the fill now producing papyrus cuttings and the stiffening of book covers [Fig. 8]. 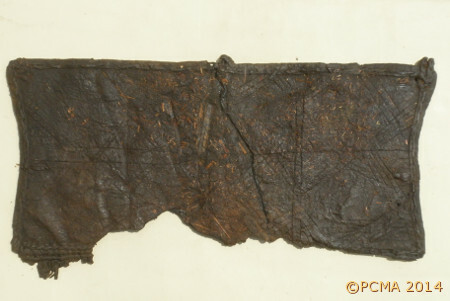 Similar evidence was found in the pit explored in 1998. Another large room measuring 8.20 m E–W by 3.90 m N–S (32 square meters) was very poorly preserved, although it did feature a floor of fragmentary bricks and stones. The foundations of the south wall could be traced. In the eastern part there was a small cellar (2.50 m by 1.20 m), partly cut in bedrock and partly constructed in brick and vaulted. It was entered via a shaft opening in the southeastern corner of the room. The cellar was found empty. On the whole, the evidence suggests an economic function for this room, which is likely to have been used contemporary with D.50 and D.41. There may have been a passage or alley about 2.65 m wide running alongside the southern extent of complex D (D.45). Two other very much destroyed rooms, D.46 and D.47, could be traced in this area, mainly in the form of traces of the foundations on bedrock. A rock-cut storage bin lined with bricks was located in the northwestern corner of room D.47. It was found empty except for baskets which may have been used originally for emptying the bin of the goods it contained before abandonment. 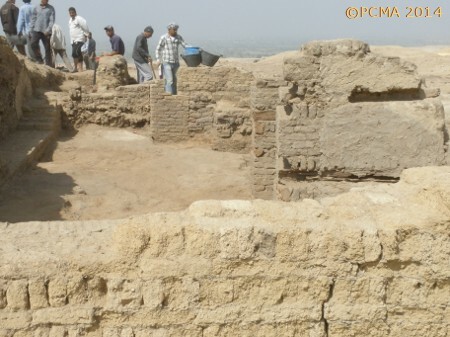 The Mission gratefully acknowledges the input and efficient assistance of the Egyptian SCA authorities, in Cairo as well as in Fayum.